The F60 was built by VEB TAKRAF Lauchhammer (today TAKRAF GmbH Lauchhammer) in Lichterfeld from 1989 to 1991. This conveyer bridge was the last to built in a series of five. It worked from March 1991 to June 1992. 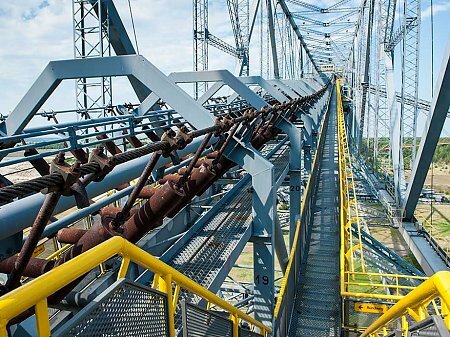 The steel-construction is also known as the „Horizontal Eiffel Tower of Lusatia“, which is the name of the region where the conveyer bridge is located. With a total length of 502 metres, the F60 beats the Eiffel Tower, which is 182 metres shorter. The width of 204 metres and the height of almost 80 metres emphasize its gigantic dimensions. The two excavators together were able to skim a maximum of 60 metres of overburden, hence the name „F60“. Today, after the modification and disassembly of some components, it still weighs 11,000 tons. Glück auf! We welcome you with this typical German miner’s greeting on our virtual tour along the „Horizontal Eiffel Tower“. Take a walk along the F60 and enjoy breath-taking panoramic views from various spots. By clicking on the coloured dots in the F60-image you can access the different viewpoints. Then you can click on the navigation tools at the bottom or you just drag your mouse freely over the screen to enjoy the spectacular 360°- panorama view. For a proper function of the virtual tour, the latest Flash Player and at least a 2000 DSL connection is required. The transformer wagon, as the name already says, transformed the incoming potential of 30 kV into many different potentials that were necessary for the bridge to operate properly. The power rating of the F60, which includes also two excavators of the series „ES 3750“, totals up to 27,000 kW. The F60 needed about 1,2 kWh of electrical energy for the process of extracting one cubic metre of overburden till it was dropped. Therefore, conveyer bridges are very economical devices to extract overburden. Nevertheless, they can be used only in some regions in Germany, such as Central Germany or in the Lausitz region (also called Lusatia), due to the layer of coal in those regions. The conveyor bridge runs on two tracks with standard gauge. Next to these are placed two tracks for the cable wagon, the transformer wagon and other supporting vehicles. The entire undercarriage runs on a total of 760 undercarriage wheels, 380 of which are powered. The maximum speed of the bridge is 13 m/min (780 m/h); its operating speed is 9 m/min (540 m/h). 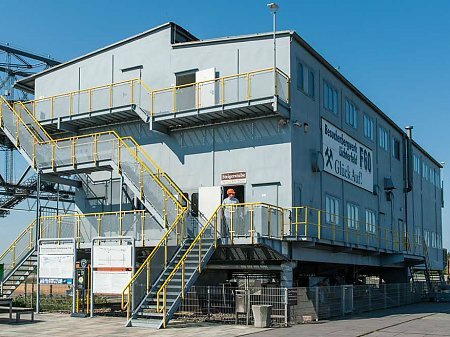 In September 2000, our former Chancellor Gerhard Schröder visited the F60. 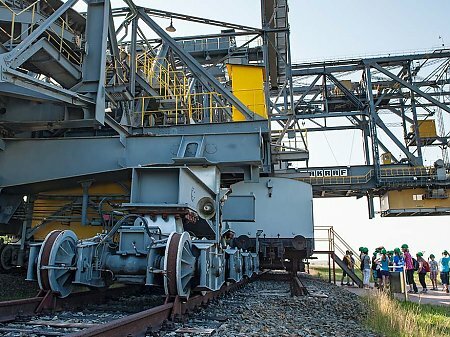 He was impressed by the huge steel giant and the typical mining landscape. Since then, the platform from which Gerhard Schröder was looking at the surrounding area is called „Chancellor’s view“. 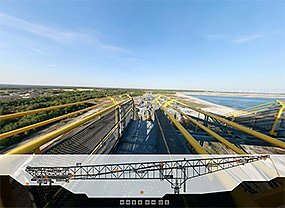 The main conveyor belt transported the overburden from the side where it was extracted to the other side, where it was dropped. Nine different belts ran at a speed up to 10 m/s (36 km/h). Two excavators supplied the northern and southern cross conveyor with overburden (27 million cubic metres till it was shut down in June 1992. 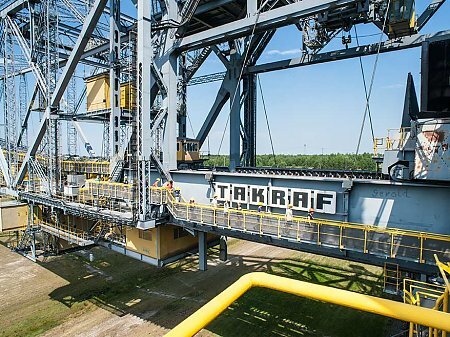 The conveying capacity of both excavators adds up to 29,000 m3/h (50,000 t). This equals the volume of a football field that was filled with overburden up to a height of 7-8 metres. This wagon, where our guided tours start and end, was originally used as maintenance area, canteen, sanitary section and as a place where the bridge crew spent their breaks. Today, this wagon is used as a tourist-information-centre. 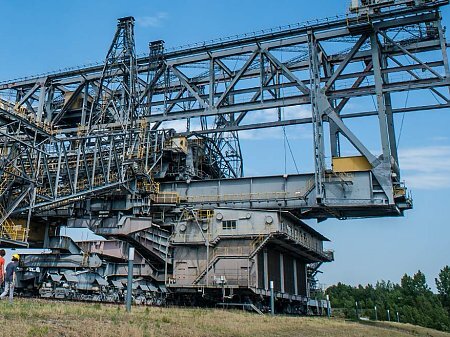 There, our guests can visit a small exhibition on the history and technology of brown coal extraction in the lower Lausitz region, which started in May 2002. It also contains a small cafeteria, where our visitors can have a typical miner’s lunch. The wagon is 29 m long, 12 m wide (with gallery) and 11 m high. As mentioned before, the bridge runs on 2 tracks, standard gauge. The F60 is equipped with a total of 760 under carriage wheels, 380 of which are powered. The working speed was 9 m/min (540 m/h). At a height of 75 m above ground level, which is the highest point of the bridge, a small glazed panorama point is located. 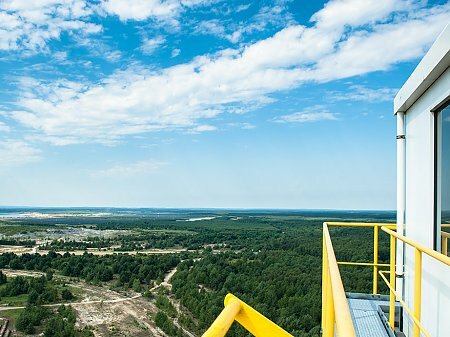 After about half of the walk along the bridge (the whole walk is about 1.4 km long) our visitors have the possibility to pause for a breath while enjoying a fantastic panoramic view over the Lausitz region.